Scottish Open Volleyball Tournament | The largest annual Volleyball event in the UK now in its 34th year. The largest annual Volleyball event in the UK now in its 34th year. The Scottish Open Volleyball Tournament is the largest annual volleyball tournament in Great Britain and attracts around 1,000 players from around the world. The next event will take place over the weekend of the 25th and 26th of May 2019. It is for all standards of player from recreational, district league and national league level who play on our 36 outside courts on the North Inch, a large parkland setting in the centre of Perth. The tournament not only attracts teams from around the United Kingdom but we have also had teams from Russia, USA, Czech Republic, Poland, Australia, Belgium, France, Italy, Netherlands, Ireland, Venezuela and the Faroes. 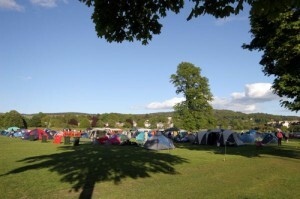 A large campsite will be available for the majority of the players but there are many hotels and bed and breakfast establishments which are only 5 minutes walk away. Full washing and toilet facilities are available within the sports centre and so there are no shortages of home comforts for those camping. The tournament has been organised to ensure that teams will get meaningful games on both days of the event with trophies for the winners of each of the 7 categories.